It's Sarsen Trail time again, our mostly annual uptake of the 26 mile walk over Salisbury Plain from Avebury to Stonehenge, of which we do the first 11 miles and then get the coach back to the start. Except that this time we did the 15 mile second half, and my outraged legs are still letting me know their thoughts on the matter. Well, we like a bit of a challenge and we’d always wondered what lies beyond the halfway point. And now we know. A lot of Salisbury Plain, and a very, very, very, very, very long track, for which the term 'wends' was specially invented. The fact that four fifths of the word 'wends' are also in 'endless' cannot be coincidence. It is also extremely dusty, but you soon learn to walk on the upwind side when traffic comes along. Weather on the first weekend of May is always a bit of a lottery - some years I've picked up a nice tan, others it's been tipping. This time was a winner, with a mostly bright and breezy day - optimum walking conditions. Getting blisters can always be awkward because you start to favour the unblistered foot and develop a hobble which puts strain in unaccustomed places - but I got a blister on each foot so that all balanced out. There are pluses and minuses to the second half, quite apart from the extra four miles. The first half takes you over the highest point of Wiltshire and the views are spectacular, but you then go down into the low ground and though the scenery changes, views are never that great again. For the second half, the scenery rarely changes but you can see all the way to the horizon. And you start with a nice view down into the Vale of Pewsey. The drawback is that having walked for a couple of hours, you'd be happy for a bit of a change, which you don't really get. The first half takes you through the occasional town and village; the second half just skirts around the military training area. You never see signs like this in the first half. 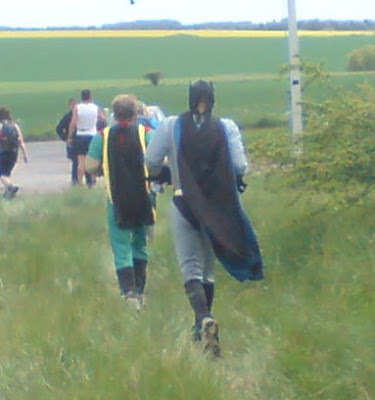 And I’ve never before been overtaken by Batman & Robin, who were running the parallel Neolithic Marathon. But the biggest plus of all must be finishing at Stonehenge. So much nicer than grinding to a halt on a lonely hilltop in the middle of the Plain prior to taking a coach back to Avebury. Even granted that the finishing area is some distance removed from the monument, you can still see it as you come over the hill and you really feel you have arrived, um, somewhere. A lady with the kind of voice that was bred to issue orders to servants welcomes you in over the loudhailer and even though your legs may have been on autopilot for the last hour, one foot in front of the other for as long as it takes, you know you made it. Looking at Wiltshire Wildlife's site I see that the event was the grand climax of Real Nappy Week - probably a coincidence, but a worthy cause nonetheless.